[S4] GRO Indexes to Deaths "2003/July BLOOMFIELD, Charles Alfred 15 February 1921 Teignbridge 4131B 15GB 110." [S2] GRO Indexes to Births "1921/Q2 BLOOMFIELD, Charles A. HESS St. Thomas 5b 100." [S3] GRO Indexes to Marriages "1916/Q1 BLOOMFIELD, George A. = HESS, Gertrude M. St. George Hanover Square 1a 1111." [S1056] Website Find My Past - 1939 Register (http://search.findmypast.co.uk/) RG101 6817D 017. [S3] GRO Indexes to Marriages "1944/Q3 BLOOMFIELD, Charles A. = RICE, Kathleen S. Newton Abbot 5bb 263." [S1070] Website Probate Search Gov.UK (https://probatesearch.service.gov.uk) BLOOMFIELD CHARLES ALFRED 17 October 2003 1320633 30 June 2003 Grant only Bristol. [S146] Personal memories of Teresa Pask née Euridge. "Information from Kelvin Euridge." [S2] GRO Indexes to Births "1920/Q4 RICE, Kathleen S. P. EDWARDS Exeter 5b 133." [S129] Burials Transcript, St. Bartholomews, Sydenham, Kent, 1832-1923 William URIDGE of Sydenham aged 44. [S370] E-mail from Esme Mitulla to Teresa Pask dated 3 January 2003: Death certificate gives age of 42 years. [S20] Website Miscellaneous (E. Mitulla internet search 17 May 2000). [S956] Vital Records Index: British Isles 2001 CD ROM Second EditionFHL Film 1067211 1813 - 1837. [S386] Baptism, St. Clement Danes, Middlesex, August 1830. [S388] Copy of Parish Register entry, Stephen Uridge and Drusilla Letitia Tucker marriage of 31 July 1867. [S4] GRO Indexes to Deaths "1838/Q2 Lewisham 5 227." [S384] Copy death certificate of William Uridge (3 April 1838). [S4] GRO Indexes to Deaths "1852/Q3 URIDGE, Lucy Islington 1b 115 aged 52." [S385] Copy death certificate of Lucy Uridge (27 August 1852). Lucy URIDGE was baptised on 15 April 1827 at St. Clement Danes' Church, Westminster, London.1,2,3 She was the daughter of William URIDGE and Lucy STANBRIDGE. [S6] Teresa Pask's Guesses, Theories and Speculation : Parents had a later child, called Lucy. [S1071] 1841 Census HO107 Piece 681 Book 5 Folio 34 Page 62. [S1075] 1881 Census RG11 Piece 2919 Folio 112 Page 49; gives place of birth as St Clements Danes, London. [S1077] 1901 Census RG13 Piece 809 Folio 66 Page 5: Gives age of 74, born in St. Albans, London. [S4] GRO Indexes to Deaths "1902/Q4 CAMPION, Frances Islington 1b 137 aged 74." [S20] Website Miscellaneous (E. Mitulla, Internet Search 17 May 2000). [S403] E-mail from Peter Campion to Teresa Pask dated 13 March, 2003: 1841 Census HO 107/681. [S1072] 1851 Census HO107 Piece 1496 Folio 715 Page 71. [S403] E-mail from Peter Campion to Teresa Pask dated 11 February 2003; states her age as 74. [S1077] 1901 Census PRO Ref RG13 Piece 161 Folio 157 Page 25. [S398] Copy death certificate of Frances Campion (26 November 1902). Kindly provided by Jenny Dare. In the Missing Friends Index 1851-1855, printed by the Argus in Melbourne "Uridge - George re brother Stephen - will hear of friend Mary Ann - if this should meet the eye..". [S88] E-mail from Philip Candy to Teresa Pask dated 4 April 2001. [S370] E-mail from Esme Mitulla to Teresa Pask dated 3 January 2003: "My mother Esther Elizabeth URIDGE told me he came to Australia when he was 14 years old (1844) he returned to England and came back 3 years later with his brother George Thomas URIDGE (345) b 1833. She also said a Mr Hultgren was on the ship the first time Stephen came. 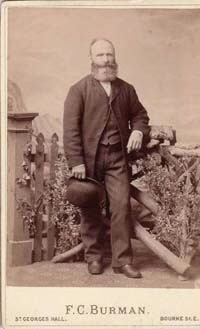 I can find a record of a A.W.Hultgren on the "Bull" leaving Sydney to Tahiti in June 1844. " [S377] E-mail from Yvonne Neuendorf to Teresa Pask dated 6 May 2002: Argus, Melbourne "Missing Friends Index 1851-55." [S377] E-mail from Yvonne Neuendorf to Teresa Pask dated 6 May 2002: Ballarat Base Hospital Admissions 1856-1913. [S15] Letter from Kevin Brady to Teresa Pask Copy of Marriage certificate. [S957] Vital Records Index: Australian 1788-1905, Ref Number: 2594. [S88] E-mail from Philip Candy to Teresa Pask Letter dated 4 April 2001. [S90] E-mail from Philip Candy to Teresa Pask, 26 April, 2001 relating to Digger - Pioneer Index. Victoria 1836-1919. Reg. Number 2594. [S377] E-mail from Yvonne Neuendorf to Teresa Pask dated 6 May 2002: Probably married a nurse. [S405] Website Uridge, Euridge One-Name Study (http://www.uridge.org/Australia/…). [S377] E-mail from Yvonne Neuendorf to Teresa Pask dated 6 May 2002. [S90] E-mail from Philip Candy to Teresa Pask, 26 April, 2001 relating to Digger - Pioneer Index. Victoria 1836-1919. Reg. Number 12814. 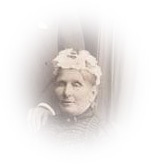 [S377] E-mail from Yvonne Neuendorf to Teresa Pask dated 6 May 2002: Died in 1908 aged 73. However the ages given are suspect. 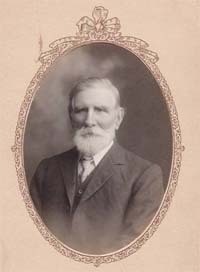 [S957] Vital Records Index: Australian 1788-1905. [S957] Vital Records Index: Australian 1788-1905, Ref Number: 6957. [S957] Vital Records Index: Australian 1788-1905, Ref Number: 7123. [S957] Vital Records Index: Australian 1788-1905, Ref Number: 14220. 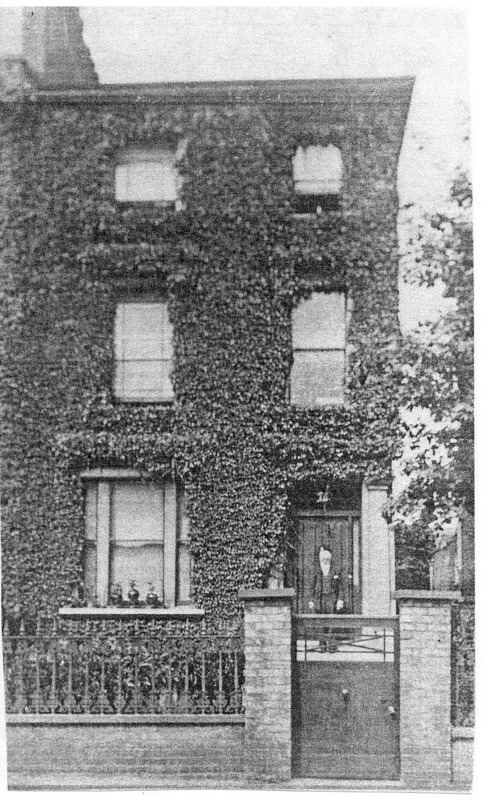 On 31 August 1852, Lucy lived at 2 Harris Place, Somers Town, Islington, London. [S1077] 1901 Census RG13 Piece 2785 Folio 60 Page 35-36: Gives age as 68, born in London. [S6] Teresa Pask's Guesses, Theories and Speculation : Saint Clement Danes to be verified. [S377] E-mail from Yvonne Neuendorf to Teresa Pask dated 6 May 2002: She has a copy of their marriage certificate, showing his age as 25. [S15] Letter from Kevin Brady to Teresa Pask dated 28 April 1987: Includes son George's birth certificate which shows marriage date. [S957] Vital Records Index: Australian 1788-1905, Ref Number: 74. [S90] E-mail from Philip Candy to Teresa Pask, 26 April, 2001 relating to Digger - Pioneer Index. Victoria 1836-1919. Reg. Number 74. [S377] E-mail from Yvonne Neuendorf to Teresa Pask dated 6 May 2002: She has a copy of their marriage certificate. [S15] Letter from Kevin Brady to Teresa Pask dated 28 April 1987: Includes son George's birth certificate. [S90] E-mail from Philip Candy to Teresa Pask, 26 April, 2001 relating to Digger - Pioneer Index. Victoria 1836-1919. Reg. Number 721. [S377] E-mail from Yvonne Neuendorf to Teresa Pask dated 6 May 2002: Geroge died in 1916 aged 82. [S377] E-mail from Yvonne Neuendorf to Teresa Pask dated 30 April 2002. [S370] E-mail from Esme Mitulla to Teresa Pask. [S957] Vital Records Index: Australian 1788-1905, Ref Number: 19531. [S957] Vital Records Index: Australian 1788-1905, Ref Number: 8904. [S957] Vital Records Index: Australian 1788-1905, Ref Number: 9362.